I was enjoying a little Sunday afternoon television, and the next thing I know, an extraordinarily loud alarm is going off in my apartment. It was the national weather service, via my television, interrupting my little doze, to tell me that more than an inch of rain had fallen at Marion Square, and that a near stationary storm cell was expected to drop torrential rains on my neighborhood. We are under a flash flood warning for the next two hours. The good thing is that the tide tonight is suppose to be especially high because of the full moon. The poor little drenched tourists. This has become a common occurrence around here this summer. We’ve had more flash floods in the past two months than I’ve seen in the almost three years I’ve lived here. I’m currently literally trapped in my apartment, and my street is a river. We’ve all spent arguably a little too much time inside this summer, resulting in a lot of lunches at my desk. Regardless of the rain, Charleston is an easy place to be happy, once you find a place to live and a job that lets you pay tourist prices for brunch. There is so much to do, and so many people to meet. I’ve been thinking a lot about making friends and the kind of people you want to be around, and what makes people want to be around you. It took me a long time to make friends when I moved here, but now I have so many fantastic friends I almost can’t remember how hard it was initially. I’m convinced it can take a good year to make friends when you move somewhere, and that you just have to accept this and keep trying. I also think the best way to make friends is to treat people like you are already their friend, and go from there. Give people the benefit of the doubt, reach out and ask someone out for a beer, or lunch, or a dog play date. Accept the fact that people already have friends and might not think of you when planning something, and invite yourself. Don’t get your feelings hurt when people who don’t know you yet don’t go out of their way for you. During my first year in Charleston, I almost made friends with this one group of people. I tried, I really did. And I just couldn’t break through, and I couldn’t really figure out why. I finally realized that I just didn’t have that much in common with these people, there was nothing wrong with me, and there was nothing wrong with them, it just wasn’t going to work. But it made me a little gunshy about trying real hard, and made my question myself and it confused me. Kind of like when you break up with someone after a fifth date. Then, last summer, when I was finally making great strides in friendship, but still had not broken through to “included” in this one particular group with a lot of potential for friendship – I saw a Facebook posting that said they were at brunch having a Sunday funday at my favorite restaurant mere blocks from my house. Man, I wanted to go. I wanted Sunday funday friends, I really thought these people might actually like me. But I didn’t have any of their numbers, and I didn’t want to be “that girl.” I marinated on my couch. Finally, I decided to stop being a wuss and called Drew, who was not there, but was my closest friend associated with this group. I told her I wanted to crash Sunday funday, and she gave me their numbers and told me to stop being crazy and to go have fun. And that is what I did. That day, I got contact info from all my new friends, and since then, they have been some of my closest and greatest friends. 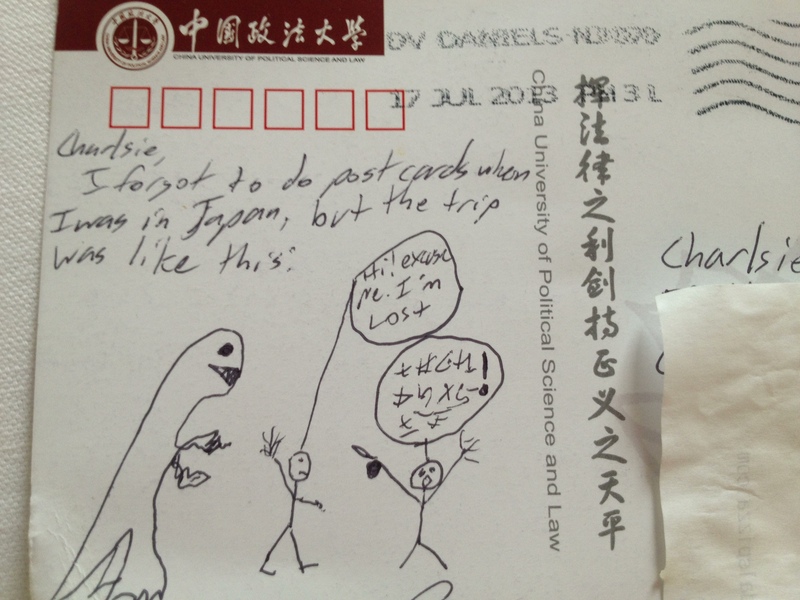 Speaking of special friends, I received the following post card yesterday from Professor Space Law PJ Blount. Even thought it didn’t actually get mailed from Japan, it is still pretty awesome. You’re welcome. *All of the gummy animals in this photo were consumed shortly after this photo, as humans are the top of the food chain in gummy world. I’m sorry I’m not sorry. 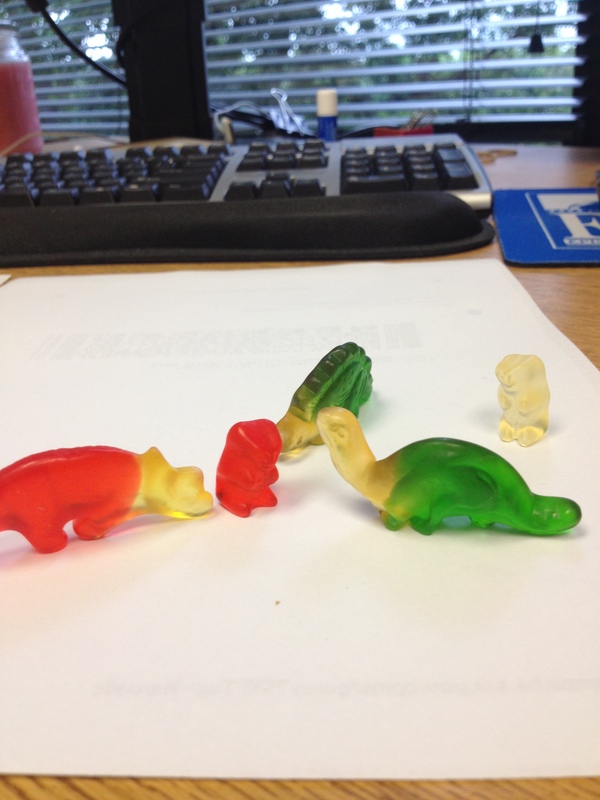 ** I’m very pleased with all of the dinosaurs in this post.